Preliminary Insurance Damage Estimates from the Black Forest Fire Total Approximately $292.8 Million. July 15, 2013 – The Rocky Mountain Insurance Information Association estimates the preliminary insured damage for the most destructive wildfire in Colorado history at $292.8 million resulting from approximately 3,630 homeowner and auto insurance claims filed so far in the Black Forest Fire. El Paso County reports 486 structures burned in the June 2013 blaze. The initial insured loss snapshot makes the Black Forest Fire the second most expensive wildfire in state history. 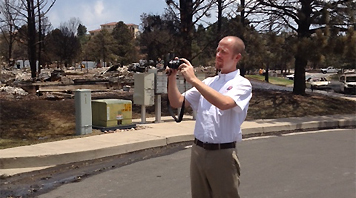 At the June 2013 one-year mark, RMIIA updated insured damage estimates for both the Waldo Canyon and High Park Fires. The Waldo Canyon Fire, for now, remains Colorado's most expensive wildfire. Waldo Canyon Fire preliminary 2012 insured loss damage estimate: $352.6 million from approximately 4,300 claims and 347 total losses. Waldo Canyon Fire June 2013 updated insured loss damage estimate: $453.7 million from approximately 6,648 claims. High Park Fire preliminary 2012 insured loss damage estimate: $97.1 million from approximately 850 claims. High Park Fire June 2013 updated insured loss damage estimate: $113.7 million from approximately 1,293 claims. The early Black Forest Fire estimates, when compared with preliminary numbers from the Waldo Canyon Fire, show more total property losses, but fewer overall home and auto insurance claims filed so far with approximately 3,630 claims that include smoke damage, additional living expenses, damaged and destroyed homes, as well as personal belongings and vehicles. There are likely a number of factors that play a role—Black Forest is more rural and wooded with a wide variety of property types ranging from large, multiple structure home sites to single family dwellings and cabins. Waldo Canyon is an urban neighborhood and densely populated, which would likely add up to more overall damage claims. These estimates do not include commercial losses. "Wildfire continues to exact a tragic and financial toll on our state," says Carole Walker, Executive Director of the Rocky Mountain Insurance Information Association. "But insurance catastrophe adjusters have been on the ground since the first evacuation notice, and the industry is prepared over the long-term to help impacted residents recover and communities rebuild. The industry has many resources available to help Coloradans work through the claims settlement process." Residents with homeowners insurance have coverage under the policy limits to repair and rebuild the structure of their home, replace their personal belongings and additional living expenses if they need to live elsewhere while their home is being repaired or rebuilt. Make sure you are working with your insurance company's adjuster (that's who your contract is with) and a reputable contractor. Cars that are damaged or destroyed are covered under the optional comprehensive portion of your auto policy. Renters insurance pays to replace personal belongings up to the policy limits. Keep in mind that it is a process that needs to be worked through step-by-step, but there is plenty of assistance available to you through your insurance company and other financial service providers.